Summary: This project will work toward completing the implementation of advanced imaging equipment needed to continue treatments at the Sea Turtle Hospital at Whitney Laboratory. This project actively leverages a donation made to the hospital. 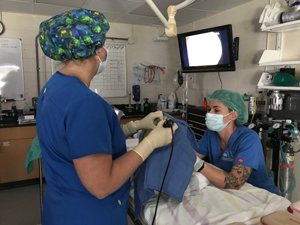 The Sea Turtle Hospital Suite received part of an endoscope used for examinations, and we will bring this needed piece of advanced imaging into our diagnostic repertoire at the Sea Turtle Hospital with the purchase of new scopes and attachments. The equipment will be essential for the evaluation and treatment of the more than 45 critical case sea turtles that we care for each year.